When a standard cargo trailer just won’t do, our stacker trailers are designed to meet your needs. Whether you are looking for a tagalong or the gooseneck/fifth wheel model, you can count on superior quality and craftsmanship! Built with an 8” H beam main frame, 16” on-center floor cross members, roof bows and 16” on-center NASCAR style wall posts, you can feel confident that your cargo will be safe. Using a 4-post hydraulic lift, you can effortlessly raise your cargo to the next level. 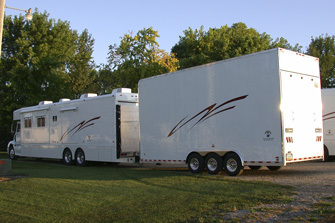 Finish off the trailer with options such as custom cabinet packages, air compressor packages, and electric packages!